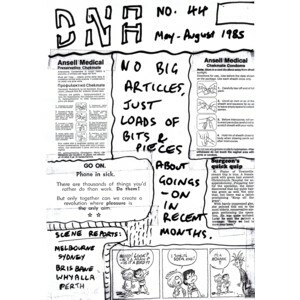 View cart “DNA issue 45 – September 1985” has been added to your cart. BAND MENTIONS – Civil Dissident (Melbourne), Depression (Melbourne), The Exploding White Mice, Fear And Loathing, Grong Grong, The Mutants, The Primevils, Punch ‘N’ Judy, The Spikes and Where’s The Pope. LIVE REVIEWS – The Exploding White Mice, Fear And Loathing, The Hoodoo Gurus (Sydney), I Spit On Your Gravy (Melbourne), The Insurgents, Kaos, Lizard Train, The Primevils, Revenge Of The Gila Monster, Sister Sludge, The Stems (Perth), The Sweet (UK) and Where’s The Pope. OTHER – Brisbane scene report, Perth scene report, Sydney scene report and Whyalla scene report.